It should come as no surprise that Georgia is a good place for fish, and for fishing. From the cold, clear trout streams of the North Georgia mountains to the big, slow rivers below the Fall Line, our waters are literally jumping with fish. According to the State of Georgia, there are well over a million anglers of all ages across the state, with a total annual impact of more than $2 billion on the state’s economy. 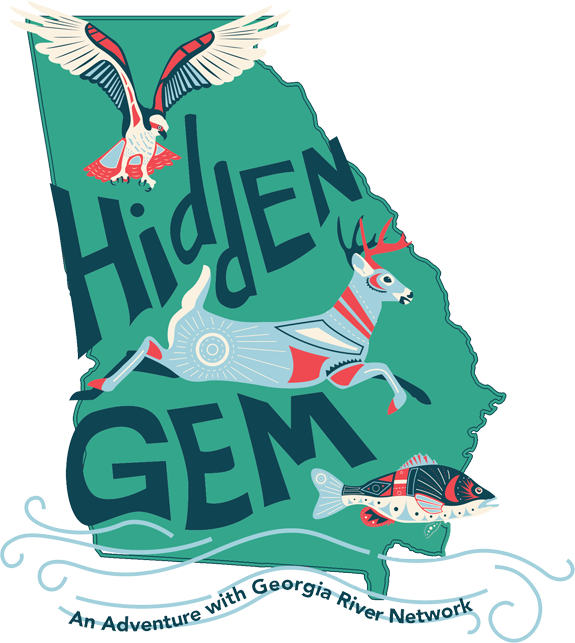 What might come as news to some is that Georgia — along with its neighbors in the Southeast — is home to some of the richest diversity of fish and other aquatic life in the world! That means simply that there are more species of fish, mussels, crayfish, snails, salamanders, frogs, turtles, insects and other critters in our streams and rivers than in most places on the planet. The beauty of this diversity is brilliantly illustrated in places like Georgia’s Conasauga River, in the North Georgia mountains, where 76 native fish species — many of them tiny and brightly colored — live in the fast-moving, crystal-clear waters near the river’s source. And it’s not just the mountain streams: it was in the lower Oconee River, after all, that scientists “re-discovered” a fish called the Robust Redhorse in the 1990s, after the species had been lost to science for more than 120 years. In river basins all across the state, there are many kinds of native freshwater mussels, whose sensitivity to water pollution makes them a conservation priority. Above the water’s surface, meanwhile, our stream and river corridors make a home for countless species of birds and mammals. In fact, outside of the North Georgia mountains and the Okefenokee Swamp, the only resident population of black bears is in an area of forestland centered around the Ocmulgee River and its bottomlands in Middle Georgia. And there are few experiences quite like paddling a South Georgia river and looking up to see the black-and-white plumage of a soaring Swallow-Tailed Kite, a migratory bird that nests along the rivers and swamps of the Coastal Plain. Below you’ll find a list of resources that will help you enjoy watching, catching and even consuming Georgia’s wildlife. HERE are guidelines developed by the Georgia Department of Natural Resources for how often certain species of fish caught in Georgia can be safely eaten. Click HERE for an EPA map that allows you to search fish consumption guidelines. HERE is a list of best bets of what you’ll be catching, depending on which river you’re fishing in. You might also want to look HERE for the length limits for keeping the fish you catch. Caught something you don’t recognize? Try looking HERE. Want to look at distribution maps for the fish in Georgia? Click HERE. The purpose of this web site is to provide information concerning the common species of mammals, birds, reptiles, and amphibians found in the State of Georgia. Each species has a home page which contains a description of the animal; its taxonomic relationships; information about the animal’s biology, natural history, distribution, and conservation status; and a review of similar animals which might be confused with it. These pages are intended for use by the general public in the identification and study of the natural history of Georgia. Click HERE to see what it’s all about. Click HERE to learn what the state’s Wildlife Resources Division is doing to protect Georgia’s diverse non-game wildlife, as well as what you can do to get involved. You can also learn about Trout Unlimited efforts to spearhead a collaborative process to improve brook trout habitat from Maine to Georgia. Visit www.camocoalition.org to learn more about Georgia Wildlife Federation’s efforts to link hunters and anglers to conservation efforts. Georgia River Network participated in a robust redhorse restoration and reintroduction project on the Ocmulgee River. To learn more about the robust redhorse, visit www.robustredhorse.com. Download rare species information at https://www.georgiawildlife.com/rare_species_profiles. Look up rare elements by watershed at https://www.georgiawildlife.com/node/1372. Use this site to determine whether listed species are located in your county which may have to be addressed as part of the National Pollutant Discharge Elimination System (NPDES) permit application process. Click here for this EPA database.